WILL ENERGY COMPANIES TELL US HOW MUCH CLIMATE POLICIES ARE ADDING TO BILLS NOW THE PRICE CAP IS COMING IN? Now Will Energy Firms Tell The Truth On Subsidies? This article was first published in a longer version by the Global Warming Policy Forum and is republished by kind permission. The full article can be found here. Britain’s electricity suppliers are reported to be considering further increases in prices to consumers. Climate policies are largely responsible for such price increases, yet government is more than content to let private energy companies and their shareholders take the blame. Intoxicated with subsidies, the electricity sector has hitherto colluded in this obfuscation of causes, but the introduction of the domestic electricity price cap may change this situation, encouraging energy suppliers and indeed all businesses to name government as the guilty party. Figure 1: UK electricity price component estimates (£/MWh) prepared by The Department of Energy and Climate Change (DECC) in 2014. Source: Chart drawn by the author from data published as part of DECC Estimated Impacts of Energy and Climate Change Policies on Energy Prices and Bills (2014). It is obvious that energy and climate policies already accounted for a large fraction of the price in 2014, prices being 17 per cent higher than they would have been in the absence of policies. By 2020 policies were predicted to make prices 37 per cent higher, and 41 per cent higher in 2030. 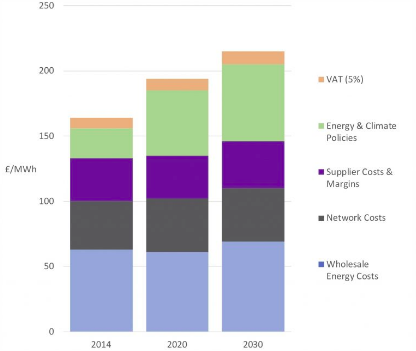 In fact, DECC’s method of presentation somewhat understates the impact since a significant part of the Network Costs are actually due to renewables, because of system balancing actions and grid expansion, and a slice of the VAT element also, of course, results from the policy costs. This is, then, a conservative presentation. Furthermore, the Central Fossil Fuel Price scenario is not necessarily the most probable. In the Low Fossil Price scenario, which appears to be materialising at present and may very well apply in 2030, energy and climate policies cause prices to be 42 per cent higher in 2020 and 62 per cent higher in 2030. While uncontroversial amongst specialists, these facts are sometimes obfuscated even by authoritative sources, such as the Committee on Climate Change (see for example, theEnergy Prices and Bills Report 2017), and it has been a brave energy company that takes the risk of candour about the in-effect-tax component, as for example Ovo energy was last year (see this blog’s discussion: ‘Policies are to Blame for Rising UK Electricity Prices’). Unfortunately, though perfectly correct, they have not been widely believed. The hazards of this must have been obvious to the main board directors concerned, but the temptation to collude was certainly extreme. The express-service renewables target timetable required subsidies so large that the increased turnover and de-risked profit made the danger of bad public relations seem tolerable. The industry may well come to regret this lack of caution. A market sector debauched by subsidies, and already held in contempt by the public, will be in a very weak position to resist nationalisation by a radical socialist government. However, government may have unwittingly forestalled this outcome, by introducing the domestic electricity price cap, a decision that could force an otherwise anaesthetised and lethargic industry into action. The uncertain, medium-term risks of a toxic public image and possible nationalisation may be pushed to one side by preoccupied executives, but an immediate crisis in revenue has to be addressed without delay. And the price cap genuinely does present a problem to the electricity supply industry. Having accepted the task of delivering the renewables policies, the industry is now being inhibited from passing the consequent additional costs on to domestic consumers via rising prices. The sums are not small. The Office for Budget Responsibility estimates that the renewables subsidy costs already amount to about £8.6billion per year in 2018/19 and will rise to about £11billion a year by the end of the current price cap period in 2023. Such steadily increasing policy costs can be recovered only from consumers, and it is therefore probable that, blocked in one direction, suppliers will and must start to increase prices where the cap does not apply, for example prices charged to households choosing fixed-term deals, and, much more probably, prices to industrial and commercial consumers.